I work from a home office so despite best efforts, my home and work life often merge in interesting and at times challenging ways. My son is back living at home for the summer having finished his term at university and with him comes the charming chaos that young men bring with them. My quiet “empty nest” is no longer quiet or empty! Work is also full of change and disruption, some welcome, some not so much. 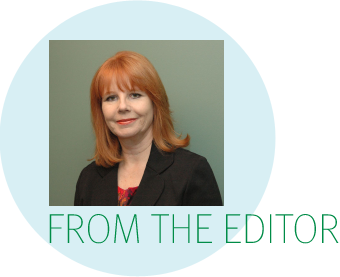 In the last issue, we told you about the loss of funding for the EatRight Ontario program – a key partner in the PEN collaboration, and we recently had multiple staff changes on the PEN Global team - the retirement of a long-time PEN evidence analyst, new PEN staff at the BDA and the excitement of not one but two upcoming maternity leaves. We’ve spent the past several months examining all our PEN processes related to finding, appraising and synthesizing the evidence to bring it to you faster, in formats that you can easily use, while still maintaining our high evidentiary standards. Social media has changed how we communicate in ways we could never have imagined when we first launched PEN in 2005. So, it also seemed like a good time to reflect on PEN eNews, get your input and ideas and make needed changes there too. Please take a few minutes to share your ideas with us by completing the PEN eNews survey. In the preface they explain that our instincts for survival mean that we tend to favour safe or familiar things. This evolutionary programming may not serve us well in this constantly changing and disrupted world in which we now live. They go so far as to say, “safe thinking has become extremely dangerous”. Sachs encourages us to spend some time doing something new or challenging. Taking on a task outside our usual area of expertise can help us become more cognitively flexible. Cognitive flexibility allows us to come at issues or problems from a different angle, often coming up with a more elegant or creative solution. I won’t give it away, but he provides some interesting case studies to illustrate this point. When things feel urgent, we tend to want to make a fast decision or form closure to reduce the feeling of stress. We don’t always make the best decisions in these circumstances; we might not consider everything we should, or our solutions may lack creativity. Spending a bit more time in open-minded consideration of the best evidence that also reflects our patient’s or community’s values before we create our position can also help us find that more elegant or creative solution/recommendation. I know that we are all busy, and dealing with “disruptions” of our own, but maybe consider Sach’s recommendation to try something totally new and different to feed your creativity and to get you problem solving in new ways. And please, take a few minutes to read this issue of PEN eNews! Learn about nutrition and dietetics in the post-truth era and how media dietitians in Australia are effectively communicating by being inclusive, positive, credible and practical. Enjoy PEN eNews 8(1) AND DON’T FORGET TO TAKE OUR SURVEY! Click on the three links below to see some of the new and updated content, tools and resources and the latest Trending Topics in PEN®. Look for the or symbol in PEN® System to see more new and enhanced content! The 2018 Nutrition Month campaign helped Canadians discover the potential of food to enhance lives, improve health, inspire children, fuel activities and bring people together. Food has the potential to improve physical and emotional wellbeing. A 2017 Ipsos Reid survey shows that half of Canadians (49%) find it challenging to eat a balanced diet when they are busy, and one in 10 say they only occasionally or never cooked or prepared food in the past month. Multiple studies have also confirmed that lifestyle interventions, including improved nutrition and increased exercise, can lower the risk of developing chronic illnesses such as type 2 diabetes or heart disease. Dietitians, like-minded organizations and the public alike joined in Nutrition Month activities from coast to coast! Potential to heal: Learn how food can promote healing and how dietitians work with health care teams to make a difference. The campaign was launched with our press release on February 22 with media pickup through to March 31. Dietitians participated in hospital settings, businesses, fitness centers, universities, schools, government agencies, grocery stores and more. The Honourable Ginette Petitpas Taylor, Minister of Health participated by releasing a letter promoting the campaign. We had 20 regional representative teams and many members who organized grassroots events across Canada. We had 17 spokespeople who faced the media with our array of key messages in English, French and Chinese. There was a 40% increase in page views on the ‘Find a Dietitian’ page on the Dietitians of Canada website from January to the end of March. The campaign achieved over 44 million media impressions and 231 stories. Realizing the changing media landscape, we planned social media activities from sponsored posts to three Facebook live events plus we developed social media assets for members to share on Twitter, Instagram and Facebook. We trended on Twitter Canada March 1st and on Dietitians Day, March 14, 2018 and hit the number one trending topic during that day. We also did advertising in high traffic areas and on social media. Overall, there were 200 million impressions of our Nutrition Month campaign! Since running the Nutrition Month for over six years now, I ponder what all of this means to me. I have an interesting perspective as I run the campaign. I feel like an osprey in her nest that looks out watching it unfold: fellow colleagues using and sharing the resources in their respective circles in their own way making them come to life. I marvel at the reach and breadth of every aspect of the campaign – there is pick up in hospitals, health clinics, public health departments, health organizations, professional organizations, human resource departments, government offices, fitness clubs, schools, universities, colleges, farmer’s markets, grocery stores, companies and our messages soar on social media platforms and in the press. I feel heartened with what I observe. Each person who takes part creates ripples in the sea of positive change, resulting in a nutrition tsunami! 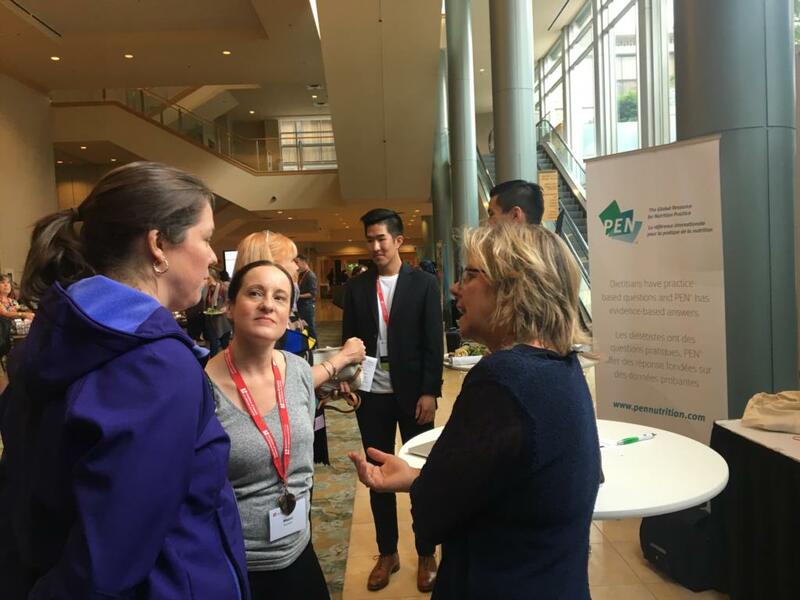 I am in awe of my RD colleague’s enthusiasm influencing change from coast to coast to coast – their events, connections with others, their commitment and enthusiasm. If anyone ever says to me that 1 person cannot make a difference, I scoff. My experience running Nutrition Month has demonstrated time and time again that when you collectively combine everyone’s efforts you synergize the outcome with compound interest. Now that’s the power of what one team can do – influence positive change, especially policy! By the way, this Newfoundland team applied and successfully received numerous proclamations in their region for Nutrition Month and Dietitians Day. I am lucky to work with all of the fabulous teams from coast to coast to coast. I know the line “Stronger Together” might sound cliché; nonetheless, I witness this each and every year as people join in. It certainly is true. If you haven’t joined in your Nutrition Month yet, consider taking part even in some small way. You can influence people in YOUR circle. What are you waiting for? Identifying Barriers and Establishing Best Practices: Celebrate our PEN Award Winners from Two Continents! 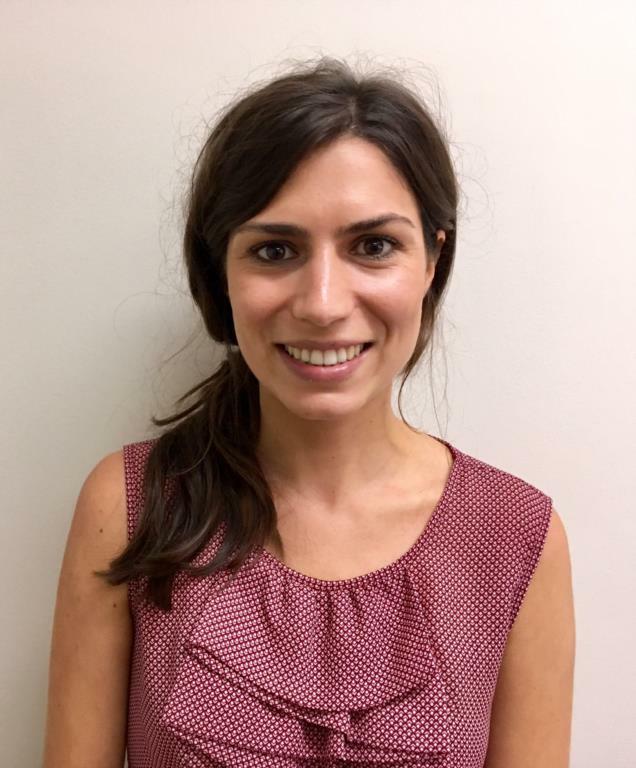 The Dietitians Association of Australia (DAA) PEN Evidence-based Practice Prize was awarded to Tayla Robertson APD, at the recent DAA National Conference held in Sydney (17-19 May). This prize is awarded for demonstrating strength and commitment to evidence-based practice in the recipient’s practice setting, particularly in challenging circumstances. Tayla, a clinical dietitian, was awarded the prize for her work in her hospital on ‘Enhanced Recovery After Surgery’. Tayla identified a delay in postoperative feeding in some colorectal surgical patients in her workplace, inconsistent with best-practice. She worked on improving this by identifying barriers to implementing early feeding among postoperative colorectal patients. Tayla now aims to implement a sustainable clinical pathway for diet upgrades in her workplace. Tayla’s application clearly demonstrated her commitment to applying the evidence-base in practice to ultimately improve outcomes for patients. We look forward to hearing more about her progress in the future. Congratulations Tayla on this achievement! Dietitians of Canada acknowledges the outstanding contributions of its members to the PEN® System with the PEN Achiever (Canada) Award. DC recognizes those who use their expertise to contribute to the evidence-based knowledge of the profession and demonstrate leadership in evidence-based practice. Are clients asking you about where to find nutrition advice that’s easy to understand, actionable and most importantly, credible? 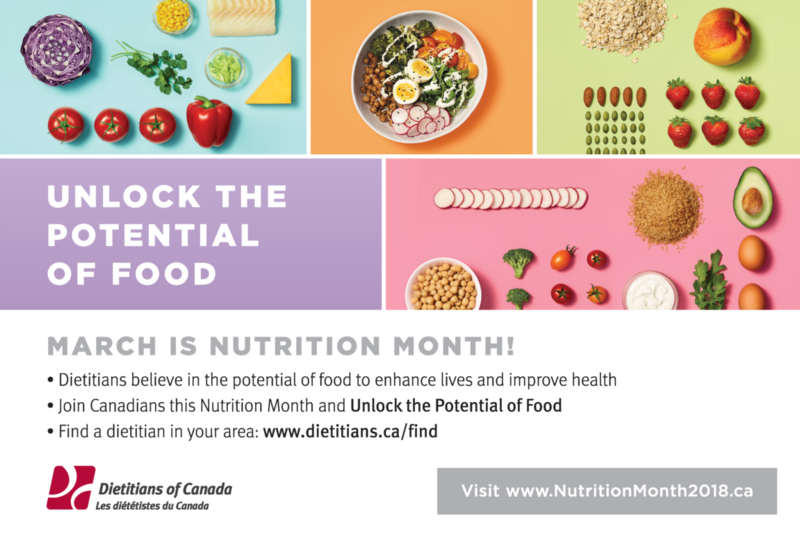 In April, Dietitians of Canada was pleased to launch UnlockFood.ca, a new website that would feature the bilingual, award-winning content, written and reviewed by dietitians using the information in PEN and previously found at eatrightontario.ca. The new name, “Unlock food”, captures the spirit of how dietitians translate nutrition information, how they look beyond fads and gimmicks and also how dietitians collaborate with their patients, clients and communities to achieve their objectives. The website has a library of over 600 articles on a diverse topic areas, a recipe collection, menu plans, videos and interactive healthy eating tools. Alongside the nutrition and healthy eating advice, the site also makes it easier for the public and health practitioners to find a dietitian. Recipes: Award winning recipes from the recent Easy Home Cooking recipe contest, including the People’s Choice winner, dietitian Whitney Hussain’s, Easy Red Lentil Dahl. Infant feeding: How to start baby on solid foods and sample meal plans for babies and toddlers. And more such as seniors nutrition, weight management, food and cooking, eating on a budget and food safety. UnlockFood.ca will begin to send out a regular e-newsletter aimed at dietitians, doctors, nurses, educators and other health intermediaries who want easy to understand and credible resources to share with their clients and colleagues. We invite you to subscribe. We will also have a newsletter for the general public with nutrition tips, healthy eating advice, recipes and more. And follow us on Facebook, Twitter and Instagram to stay connected. The PEN® System has a vast collection of knowledge pathways covering the nutrition care process of many clinical conditions and their nutritional management. Fourteen of the 197 knowledge pathways in PEN are diabetes-specific and are currently in the process of being updated to reflect the newly released UK and Canadian diabetes clinical practice guidelines, with help from contributors from Australia, Canada and the UK. While these knowledge pathways are being updated, Dietitians of Canada and the British Dietetic Association are collaboratively condensing various parts of the UK and Canadian updated diabetes guidelines for you, and in true PEN style, translating the evidence into practical advice. These joint submissions will be featured in current and future PEN eNews issues. This issue will focus on type 2 diabetes, remission and obesity. The 2011 Diabetes UK nutrition guidelines were updated in March 2018. These guidelines acknowledge the important role of the registered dietitian and recommend that all individuals with diabetes and those at high risk of type 2 diabetes see a registered dietitian for nutrition counselling (1). It is great to see that these guidelines focus on food rather than nutrients. One of my lecturers at university always used to point out “we eat food not nutrients”! The guidelines cover all aspects of prevention and management; however, there are some new recommendations about type 2 diabetes remission (1). There is a lot of interest in the remission of type 2 diabetes. In practice, many patients have asked me – can I cure my diabetes? Currently, the term ‘remission’ rather than ‘cure’ is used as diabetes has been seen to reoccur with or without the maintenance of dietary changes. This was demonstrated in the SOS study (2). Remission rates were high in those with major weight reductions (over 15 BMI units); however, not all of those who maintained their major weight reductions maintained remission. Individuals with diabetes in remission will, therefore, need to continue to have their HbA1c monitored and annual diabetes checks, including retinopathy screening. Aim for 15 kg weight loss as soon as diagnosis for remission (1). A recent RCT influenced this recommendation as 86% of participants that lost >15 kg of weight achieved remission (3). Aim for 5% weight loss to improve glycaemic control and to reduce CVD risk (for those diagnosed for >6 years/less likely to achieve remission) (1). Bariatric surgery is recommended as a treatment option for individuals with diabetes with a BMI of 30 kg/m2 and above. Remission is reported in 30-62% of patients following surgery, 30-50% or more may eventually experience relapse. The greatest resilience to relapse is seen in those who have diabetes for a shorter duration of time. No specific diets were recommended over another as there is limited research comparing head-to-head diets; instead the advice was to reduced energy intake and increased energy expenditure. The most important aspect was adherence rather than type of diet. Low carbohydrate diets (LCD) are noted as being safe and effective short-term for weight loss (likely due to carbohydrate reduction restricting energy intake) but long-term side-effects are unknown. Very low carb ketogenic diet - 10% dietary intake from carbs (<50 g/day). Diabetes Canada’s updated guidelines for the prevention and management of diabetes include nutrition therapy and weight management chapters that address the important influence of body weight on glycemic control, blood pressure and insulin sensitivity (4). The updated guidelines acknowledge the important role of the registered dietitian as a member of an interprofessional team initiating intensive behavioural interventions for weight management. 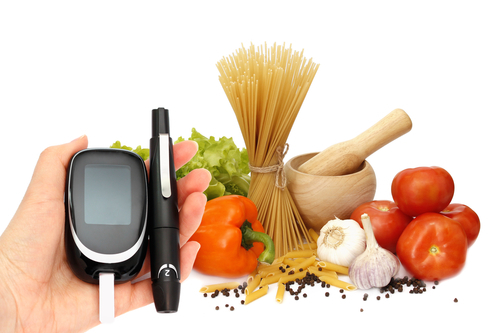 It is recommended that all individuals with diabetes see a registered dietitian for nutrition counselling. The need to address obesity and diabetes on a population health level . “The dominant effect of obesity in precipitating glucose intolerance and its consequences suggests that reversal of the diabetes epidemic can only come about with urgent and substantial changes to health behaviours on a population level. It is important to recognize that the health sector on its own cannot accomplish population-wide changes. New strategic relationships with groups that have an impact on health (e.g. food industry and construction industry) are needed to help create an environment more conducive to an active lifestyle and healthy eating habits”. Upon diagnosis with prediabetes or type 2 diabetes anthropometric measurements should be taken as a baseline and to assist the diabetes team in determining if the initial goal is weight maintenance, loss and/or prevention of weight regain. For individuals with diabetes with overweight or obesity, part of the education process should include a discussion of the potential glycemic, blood pressure and insulin sensitivity improvements of achieving 5% to 10% loss of current body weight. There are a number of nutritional approaches that individuals with diabetes can choose from to meet their weight loss goals. Rather than being overly prescriptive, collaboration with clients is encouraged to develop an individualized plan that respects personal and cultural dietary preferences. Evidence supports the efficacy of several approaches for weight loss in diabetes, such as a high monounsaturated fatty acid diet; vegan or vegetarian diet; DASH; and some popular weight loss diets (Atkins™, Protein Power Plan™, Ornish™, Zone™, Weight Watchers™). In addition to the selected dietary pattern for weight loss, individuals should aim for regularity in timing and distribution of carbohydrate; selection of low glycemic index foods, optimizing fibre intake (30 to 50 g/day, with 10 to 20 g/day from viscous sources) and overall portion control. The updated clinical practice guidelines note that the evidence on intermittent fasting for type 2 diabetes is limited to short-term studies and while this approach may appear to be as effective as consistent energy restriction for achieving weight loss, oral hypoglycemic medications may require significant change on fasting days to reduce the risk of hypoglycemia. Meal replacement products, used in place of one or two meals per day for up to one year with maintenance of up to 86 weeks, have demonstrated comparable or increased weight loss compared to energy-restricted diets in studies with people with type 2 diabetes . There is limited evidence to support the use of products specifically formulated for individuals with diabetes. A focus on dietary interventions for weight loss that can be maintained over the long term is advised as is preparing food with fresh, unprocessed ingredients consumed as part of family meals. Although evidence supports the efficacy of several approaches for weight loss in diabetes, there are uncertainties in regard to the most effective weight loss strategy. Discuss with clients what method of energy deficit/energy expenditure they feel is more achievable and sustainable as this is likely to be more important than specific macronutrient compositions. All individuals with diabetes should see a registered dietitian for nutrition counselling. Dietitians are encouraged to develop an individualized plan that respects personal and cultural dietary preferences. Both of these guidelines promote addressing obesity to help achieve better health outcomes, including diabetes remission, improved glycemic control and improved cardiovascular risk. As dietitians, we may struggle, in practice or conceptually, with the balance of the promoting weight loss versus promoting body size acceptance. These are not mutually exclusive. These diabetes guidelines indicate the impact of weight loss in those with diabetes and with overweight and obesity. Although neither guideline speaks specifically to the need for body size inclusiveness, the emphasis on care that is individualized and respectful provides a foundation for this view. UK: www.diabetes.org.uk/nutrition-guidelines. “Guidelines for education and care delivery, prevention of Type 2 diabetes, glycaemic control for Type 1 and Type 2 diabetes, cardiovascular disease risk management, management of diabetes-related complications, other considerations including comorbidities, nutrition support, pregnancy and lactation, eating disorders, micronutrients, food supplements, functional foods, commercial diabetic foods and nutritive and non-nutritive sweeteners are included. The sections on pregnancy and prevention of Type 2 diabetes have been enlarged and the weight management section modified to include considerations of remission of Type 2 diabetes. A section evaluating detailed considerations in ethnic minorities has been included as a new topic” (1). Canada: www.diabetes.ca. In addition to background reviews of the evidence that has informed the recommendations, information on pharmacotherapy for weight loss, bariatric surgery, a summary table of the properties of common nutrition interventions and a stage-targeted diagram of nutrition and behavioural interventions for type 2 diabetes are included. Readers can also access related tools, slides, videos and webinars from this website. The Dietitians Association of Australia (DAA) was thrilled to welcome UK-based Professor Judith Swift as an invited speaker at our recent National Conference in Sydney (17-19 May 2018). Judith’s plenary session, in front of more than 850 delegates, was titled ‘Nutrition and dietetics in the post-truth era: Alternative facts, conflicts of interest and nutribollox’. Prof Swift outlined that there is, and always has been, a huge diversity in the backgrounds and practice of people working in the nutrition space, in addition to university-qualified dietitians. These include celebrities, social media influencers, wellness bloggers, fitness coaches, and natural therapists. Judith also highlighted a tradition of those with medical qualifications offering advice that contradicts the dominant interpretation of the evidence-base – the self-proclaimed ‘mavericks’. She shared with conference delegates the very real concern that the authority of accredited or registered dietitians is being questioned as never before – and that this is perhaps a result of wide-spread neoliberal attitudes but is also fostered by ‘insiders' (the mavericks) who are actively developing adversarial narratives. Prof Swift said social media, particularly Twitter, is being used to question the integrity of dietitians and professional organisations, with allegations ranging from undisclosed conflicts of interest, to cherry-picking evidence, to outright corruption. Work with other interpretations of health (that is, ‘Let’s accept others’ notions of health’) and tackle implicit weight stigma. Despite all the challenges, Prof Swift said there is a huge opportunity for dietitians to work together to redefine and strengthen our professional identities, and to ‘move forward with humility, confidence and optimism’. PEN® eNews is turning 7 – tell us what type of articles work for you! Happy birthday, PEN® eNews! Today’s issue marks seven years of articles dedicated to positioning dietitians and nutritionists as leaders in evidence-based practice, enhancing critical appraisal skills and optimizing the value of PEN for our users. From the beginning, PEN® eNews has been a free, bimonthly newsletter. We currently have over 13,498 international subscribers. Most of Volume 1 had a magazine-like format, but after that switched to the searchable, tagged article, scrolling webpage format that is still in use today. Over the years, some sections have stayed the same (e.g. thought-provoking editorials, What’s New in PEN®?, How Do I…, Thank You to Our PEN® Volunteers) whereas other sections have evolved (e.g. PEN® Insider, Surprising Findings). We recognize that not all of our PEN® eNews readers have been subscribers since the beginning. Why not take a peek at some of our most read issues? Throughout the past seven years, one thing is certain: the PEN® Global team is always looking for ways to improve what we do and how we do it and this includes PEN eNews. Times have changed since our first issue was published in June 2011 and we’re wondering if it’s time for PEN® eNews to change too. Does the format need to be tweaked? Should the frequency change? Are the issues too long? Are we missing critical content areas? 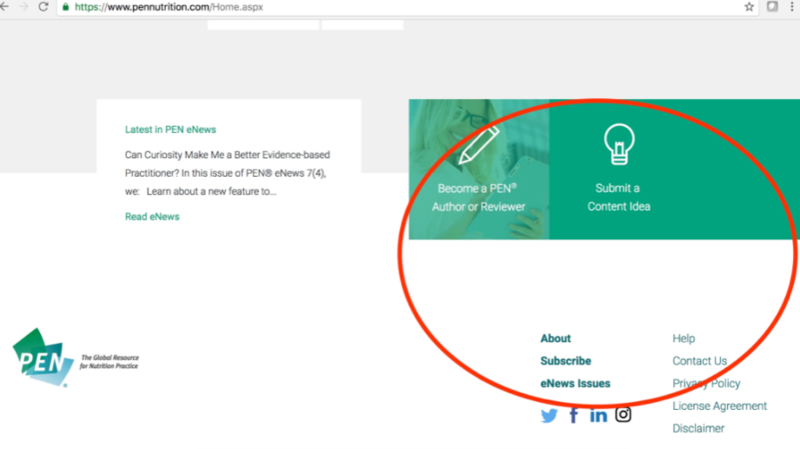 Should we convert PEN® eNews to a blog? Making nutrition news in Australia . . . Why you shouldn’t overdo superfoods, plant-based diets, the gut microbiome, new research into pasta and weight loss, mood-boosting foods, portions sizes of café cakes and muffins, and the World Health Organisation’s action plan to remove trans fatty acids from the food supply. These are just some of the stories that the Dietitians Association of Australia (DAA) has been contacted about by journalists in recent months (Note: For a snapshot of news items involving Australian dietitians, visit the Dietitians Making News webpage on the DAA website, and follow the hashtag #DietitiansDoMedia via social media). DAA has 25 media spokespeople who are involved in approximately 700 media interviews a year (or, on average, just under 60 interviews a month). Their role is to discuss evidence-based nutrition information through the media, and to help position Accredited Practising Dietitians (APDs) as the ‘go-to’ people for nutrition advice and support. The DAA team recently collaborated with a small group of spokespeople and also a media consultant to develop ‘Approach to communications’ guidelines to further support DAA spokespeople with media interviews. We launched these to spokespeople in October 2017 and have since also shared them with our ‘APD media group’ (made up of around 100 APDs who are registered with DAA as interested in speaking with journalists or journalism students). Often, in media interviews, the focus is on getting accurate messages across – so really nailing ‘what’ is communicated. And while this is crucial for an evidence-based profession, ‘how’ we communicate is just as important. Ultimately, we want a consistent voice, that connects with people. In today’s ‘post-truth, post-trust’ world, dietitian’s positions on food and nutrition are being tested more and more. We’re even sometimes subject to criticism or pitted against others with an opinion on nutrition. Being warm, positive and above the conflict in all our communications means we achieve more of what we want in our community, while at the same time building our influence and protecting our reputation. Ultimately, this places us in the best position to get across evidence-based nutrition messages, and to raise awareness of the role dietitians play in improving people’s health and wellbeing – things we are all passionate about! So, what’s our ‘Approach to communications’? By ‘inclusive’ – we mean searching for common ground and also using words that connect with people. By ‘positive’ – we mean approaching questions in an up-beat, light and encouraging manner. By ‘credible’ – we want to highlight that we are nutrition professionals with at least four years of university study behind us, so our advice is reliable and trustworthy. And by ‘practical’ – we mean offering people relatable and ‘doable’ advice and solutions, which are backed by science. While it might be tempting to say something like “Oh, it’s just another in a long line of fad diets that aren’t based on science”. In other words, our first reaction might be to dismiss the diet. But unfortunately, this approach doesn’t do us any favours in terms of connecting with people. Find some common ground (rather than the negatives). Maybe the diet is unbalanced and not based on evidence, but it emphasises eating vegetables, and that’s a good thing. So we might say something like: “Such and such a diet has some really great aspects, like it’s emphasis on vegetables”. Then we’d want to get across our position, or the evidence as it currently stands. We could follow up with something like: “But it cuts out certain healthy food groups, so for some people, it will be hard to stick with in the long-term, and we know from research that the best ‘diet’ is the one you can maintain over time”. Then, we’d look to offer people practical and relatable advice and solutions to consider. Maybe something like: “So certainly focus on adding more vegetables to your day – that’s a great place to start for most of us – and why not start a food diary to keep track of what you’re eating – (and so on)”. This approach is all about understanding that people will have different opinions. It’s about resisting the urge to tell people they’re ‘wrong’, and instead aiming to find some common ground, then bridging across to the evidence or your position. And importantly, aiming to connect with people along the way by being warm, positive, encouraging and practical. The media is a really powerful avenue for promoting evidence-based nutrition. Not all of us will star on prime-time television or the front page of the national newspaper, but as dietitians, communicating is at the heart of what we do – and the ‘how’ in going about this is important if we are to protect and build our influence and achieve our goal of helping people to be healthier. The theme of the 35th National Conference of the Dietitians Association of Australia (DAA) 17- 19 May in Sydney was Think BIG. More than 100 delegates registered for the two featured PEN workshops. 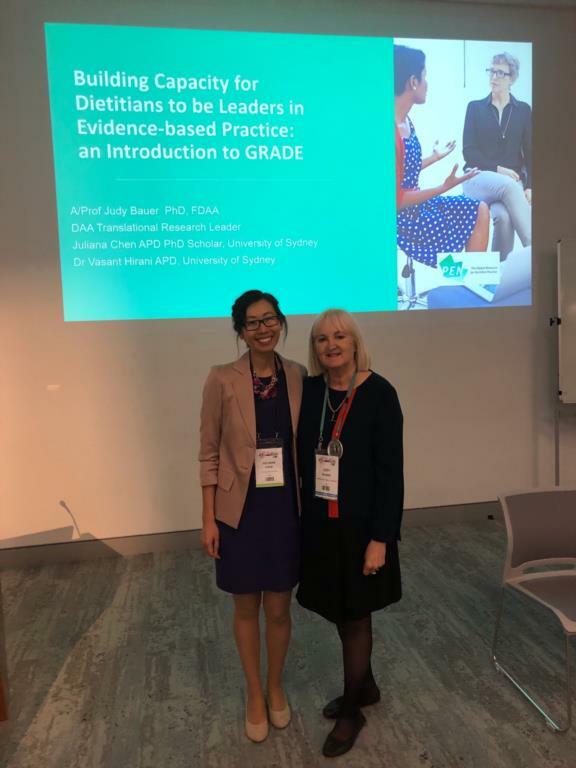 The first advanced workshop, ‘Building Capacity for Dietitians to be Leaders in Evidence-based Practice: An Introduction to GRADE’ was facilitated by A/Professor Judy Bauer (DAA, University of Queensland), Dr Visant Hirani (University of Sydney) and Ms Juliana Chen (PhD scholar, University of Sydney). 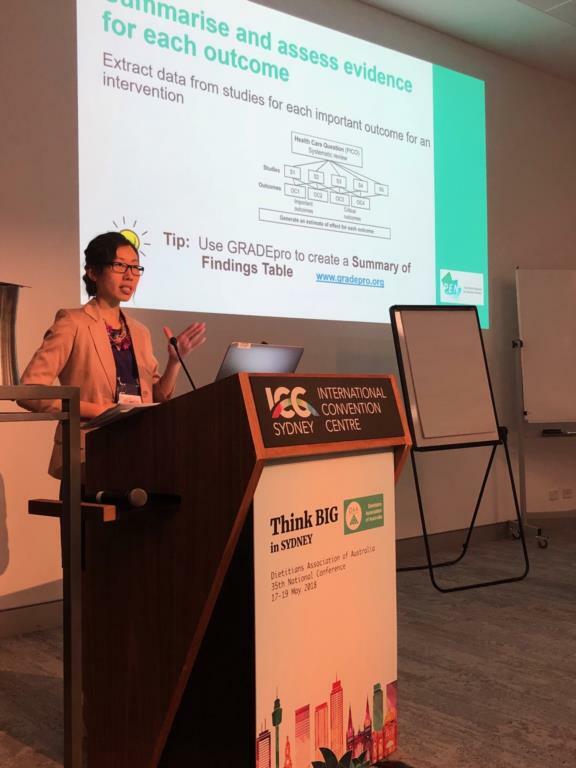 Delegates were shown how the PEN-GRADE approach is used in systematic reviews, the factors used to evaluate the quality of evidence and strength of recommendations, and how to participate in the PEN-GRADE process. The second introductory workshop, ‘PEN Tips and Tools to Power Your Practice’ was facilitated by A/Professor Judy Bauer (DAA, University of Queensland) and Dr Penny Love (Deakin University). 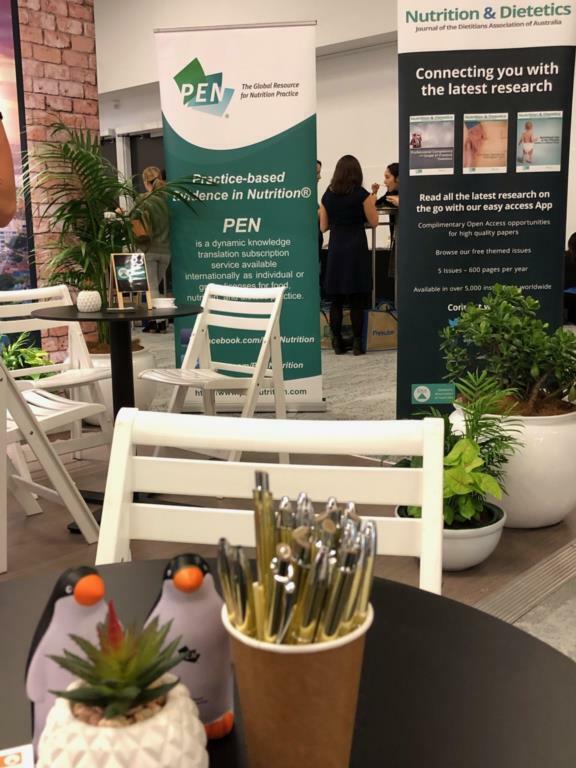 The workshop highlighted how PEN can assist dietetics practice to be evidence-based and the application of knowledge pathways, practice questions, consumer and professional tools and resources to practice. DAA would like to thank our fantastic volunteers, Visant, Juliana and Penny for contributing to the success of these workshops. How do I... Use and access PEN® to provide evidence-based information in my practice? As dietitians, we are committed to evidence-based practice where we translate science into practical information that clients can use to manage their health. Use the Practice-based Evidence in Nutrition: PEN® database to help ensure your advice is based on the best available information. 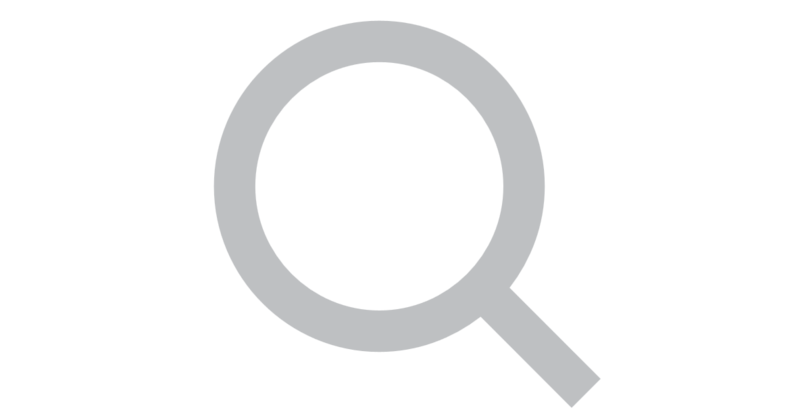 PEN® is an online searchable database designed FOR dietitians BY dietitians. PEN® helps YOU be a leader in evidence-based practice! Practice-based Evidence in Nutrition (PEN) is a dynamic knowledge translation tool. The Knowledge Pathways in PEN® provide practice questions and answers along with related background and practice guidance information, tools and resources, all in bite-sized doses. If you are not already a subscriber, sign-up or take a trial. √ Take a PEN tour. Or go to About PEN to read more about the features in the PEN database. √ Explore the Table of Contents. There is a variety of content for different practice areas. 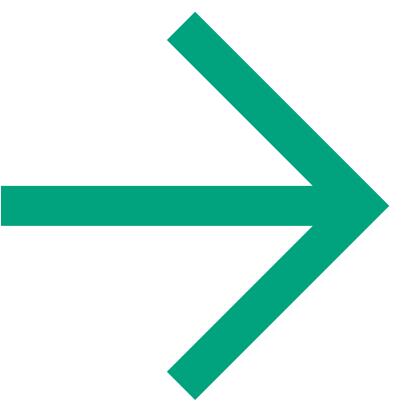 √ Sign up to get Content Alerts. You can receive biweekly or monthly emails about new and updated information within your preferred knowledge pathways and get updates on Trending Topics. √ Check out PEN Help and Support. This section can help answer some questions you may have about PEN. 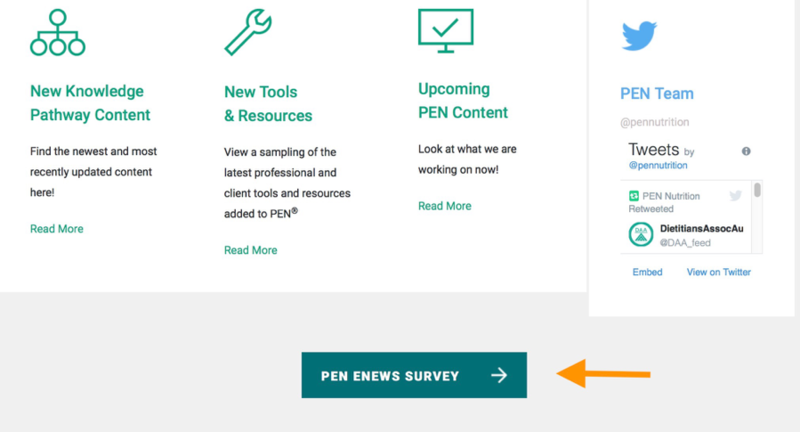 As always we welcome your feedback on the tools and resources in PEN®. At any time you can contact us, submit a content idea or become a PEN® author or reviewer. The theme of this year’s conference in beautiful Vancouver: Elevate, Influence, Inspire. In her talk, Dr. Mary Anne Smith, PEN Evidence Analyst, elevated the quality of conference presentations with a balanced evidence- based review of GMO’s as part of a session called: “Hot topics in everyday practice”. This session also covered leaky gut and nutritional genomics and was well attended. Mary Anne received accolades for “nailing” a difficult topic. 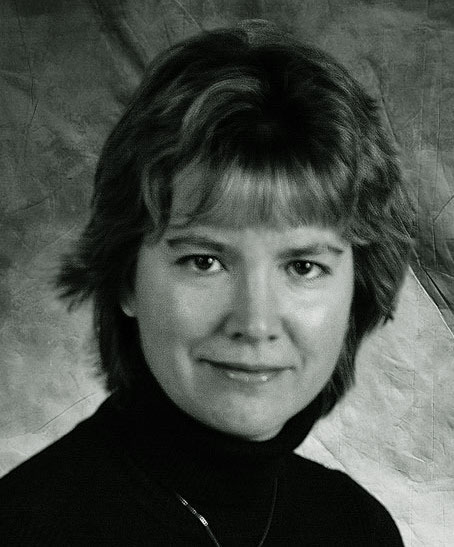 Mary Anne also authored the PEN Background on GMOs. Another highlight of the PEN presence was our booth. In the 2 ½ days we ran the booth we had excellent dialogue with PEN users and a few not familiar with PEN. Announcing the creation of a Cannabis and Health knowledge pathway (KP) as an upcoming topic influenced conference attendees to stop by as they were intrigued to learn what would be covered in this new pathway. A number of dietitians are already dealing with medical cannabis use, particularly in long-term care institutions for dealing with pain and as an appetite stimulant. Authors contributing to the KP were present during specific times and were able to get feedback on planned content. We also signed up reviewers for upcoming content and have a fairly extensive list of new content topics to consider. It is always great to dialogue with our PEN users in person. We gain so much from their constructive feedback and they value the opportunity to discuss with members of the PEN team as well. Finally, PENny made another appearance at a DC conference and was picked up by dietitians from across the country who returned home inspired to act on their learnings from sessions they attended. Already looking forward to next year: Capitalize on our Connections - June 5-8, 2019 in Ottawa, our nation’s capital. How Do I … use and access PEN® to provide evidence-based information in my practice?